An etching of Charles II and his court viewing a horse race at Datchet Ferry from the royal box, protected by Yeomen of the Guard. In front of the box is a set of weighing scales to measure the weight of the jockeys. There is a view of the river and Windsor Castle in the background. With English inscriptions above and below, including the publisher's address, 'Sold by P.Tempest over against Somerset House Water Gate in the Strand, and S.Baker at the White Horse in Fleet Street.' Borders trimmed. Royal interest in horse racing can be traced to the reign of James VI and I, but the sport was outlawed by the Commonwealth. The first race of Charles II's reign probably took place at Epsom in 1661. Charles even competed in races himself, winning the Newmarket Town Plate in 1671 and 1675. 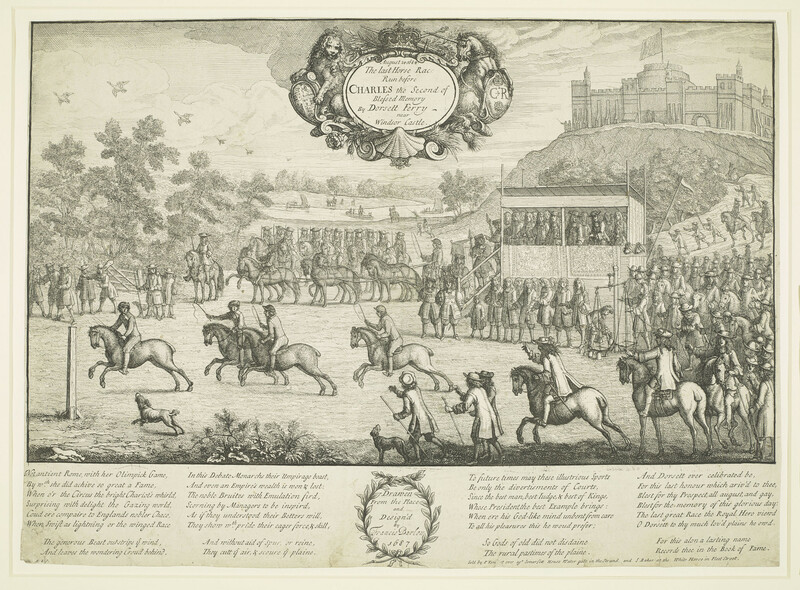 Francis Barlow's etching records the final race to be watched by Charles II, on 24 August 1684 at Windsor (the title inscribed on the print mistakenly gives the location as Dorsett rather than Datchet.) Often considered to be the first racing print, it was used as the model for a painting of the same scene, which is also in the Royal Collection (RCIN 400612). Published in 1687, two years after Charles's death, this print has been interpreted as a commentary on the unhappy reign of James II, implicitly contrasting the turmoil of his day with the light-hearted diversions of his brother's reign.